SUPER HAIR TABLETS 60' Dietary supplement. 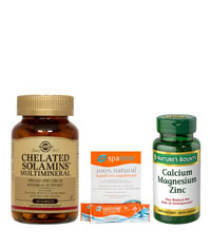 Vitamins and minerals for healthy hair. ..
CARNIVITA FORTE TABS 30 S -To protect against muscle disease and stamina during heavy exercise & improve performance during physical effort. - In cardiac diseases to improve hear..
JOINTFREE CAP 110'S Dietary supplement, promotes healthy joints and cartilage maintenance. Improves joint health Supports motion comfort &nb..
JOINTFREE TRIPLE ACTION Dietary supplement, promotes healthy joints and cartilage maintenance. Improves joint health Supports motion comfort Glucosamine imp.. Description : Red Yeast Rice has been in the traditional Chinese diet for centuries. Two capsules contains 1,200 milligrams of Red Yeast Rice Powder from the Chinese botanical Monascus purpure.. PURE GOLD COLLAGEN 10 X 50 ML 10- Days programme of liquid dietary supplement that contains Collagen, Vitamins and Minerals for skin, hair and nails' vitality. ..
Lecithin provides a natural source of polyunsaturates including choline and inositol which studies have shown, may be of help in lowering cholesterol. Good liver support. Neurological conditions.. Description Male Libido Tonic Dietary Supplement Tongkat Ali, also known as Long Jack, has been shown to support male hormonal balance (including testosteron..
Glucosamine promotes joint health and nutritionally works to promote the structural framework of healthy joints. Glucosamine and Chondroitin both provide the essential structural material glycosamin..